Have you ever ‘herd’ or read something and thought ‘Gee, that is a great idea!’? Well I did ~ from my favorite blogger Marian of missmustardseed.com, I have been a follower for years and she recently began creating a monthly post of her favorite places, items, music, tips, products, etc and I thought ‘what a great idea!’ to share what we know or experience or purchase, spreading the word and sharing with friends. You know like when your friend has an amazing scarf on and you gotta know where she purchased it or whom made it….. It keeps us in the know and businesses in business….and sharing! So here I am, sharing my favorites thru my blog, I will post every now and then about a favorite find, a unique shop, a fun product, a cool technique ~ you get the picture……I will call it ‘Playin’ Favorites’. here are my ‘at the moment’ favorites that make my heart go pitter patter….. It is no surprise that this idea of cows came from Miss Mustard Seed…..I am a follower because I love her style and she has an eye for great things, so count Marian’s blog as a favorite. The moment she posted about her cast iron cows, I was on the hunt and am having fun collecting them. These cows were purchased for me by my good friend Tracy, after she saw me drooling over them, I am sure! I know that this is hit or miss at an antique store and I cannot send you to a big box store to purchase……..but that is what makes antiquing so desirable to me….you hunt for things you love and not everyone is going to have what you have….. These cows were found at a favorite shop of mine, Tink’s Antiques in Tamaqua PA if you’re looking for a cool shop to treasure hunt…. You see how this works?…..Miss Mustard Seed shared her interest and created a fun new interest to me….will you be hunting for cast iron cows? I am not sure what it is about blue swatches but when I enter Sherwin Williams I gather them up. I would take a blue swatch over a fist full of diamonds any day. Call me Coo Coo. My home interior walls for the past 10 years have been painted in Sherwin Williams – Rain…and if I were to repaint I would pick the same color, blue walls, white trim, black hardware and green accents. Do you have a passion for a color? Do you collect paint swatches like penny candy? Aveda Hair Products….because I am blessed with fine, flat, poker straight hair! Sometimes you get all the wrong family traits….my Grandfather was 6′ 5ish” with beautiful thick hair. I am 5′ 2″, with fine flat hair….BUT, I have learned to work with what I have and appreciate it, non-the-less. My hair stylist Chris Watson and I have come up with a magical mix of Aveda products…like a scientific concoction of all the right measurements to make my hair do what it does…..it is 6 products, 7 including hair spray. And it works!…..cleansing shampoo, hair thickener, hair volumizing style prep, hair gel, hair wax with damage control…and then hair spray (because I am from the 80’s and that is what we do). With all these products and the right mix…my hair still has movement and even memory (if a wind storm shall hit, I am prepared), and it doesn’t look like I have a helmet on my head….awesome-ness! If you are local…check out Chris Watson of Ultimate Image in McAdoo PA! Since Art is big huge part of my life….how can I not share my favorite products I am using at the moment. 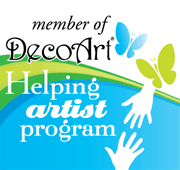 I am a creature of habit and when working on a piece I usually stick with the same old tried and true because it is what works for me…….but since I am a DecoArt Helping Artist, I like to stick my neck out once in a while and play. 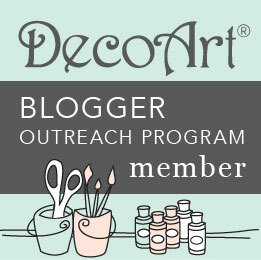 I recently discovered DecoArt Glamour Dust Glitter Paint….and it has changed my life (artistically speaking). If you haven’t tried this….it adds a subtle shimmer to your project. I used it on a few Christmas projects last year and this year I used Black Ice Glamour Dust on each ornie of the Classic Halloween Ornament Club! Lovin’ it…. The DecoArt site will inspire you……the Glamour Dust Glitter Paint can be purchased at your local Michael’s, AC Moore or Hobby Lobby or on-line at Viking Woodcrafts. On the Ornies, I also used Miss Mustard Seed Flapper Black German Glass Glitter…..there is no turning back once you try Glass Glitter! Vintage Linen, oh’ how beautiful! I love the warmth, soft-ness and even the ‘nubs’ of time worn vintage linen. Susan will create custom pieces for you too….the 3 bags shown were all purchased this year. Two of them were created with special requests from me! The workmanship is beautiful….and if vintage linen is your thing, this is a go-to shop! I am working with Susan on a linen smock at the moment……I will be sure to share more soon….my big decison is to go with Indigo or Natural…..mmmm, what will I do? …and What is on My Coffee Table? typically any edition of Where Women Create. I get my inspiration, ideas and drive by all the women within the pages of these magazines. hands-down my favorite! It is a magazine sharing Women’s Creative Spaces and Studios, along with their amazing stories….it is truly unlike any magazine I have ever read. PS ~ this is not a paid post, all opinions are my own. I included links to click onto and links are included if you ‘hover’ over names. Enjoy! I’m loving all your favourites! Especially the cows… I’ll definitely be visiting, searching and trialling all of them. Thanks Effie….the cows are fun! Love sharing all the fun finds! Thank you! Always fun to share my favorite places and products! Thanks for sharing all your fun finds.